Chupicuaro (Mexico) polychrome female doll made of clay and paint, 11 inches tall (est. $3,000-$12,000). 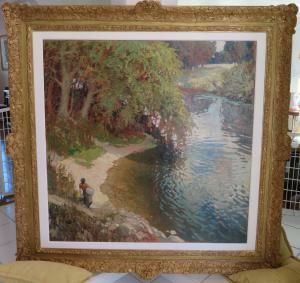 Original oil on canvas figural landscape painting by Latvian-born German painter Walter Kurau (est. $40,000-$55,000). 8th century Bactrian camel figure from the Tang dynasty, made of terra cotta and paint (est. $50,000-$150,000). Circa 1890s Apache grain barrel, made by the White Mountain Apache in Arizona of willow and devil's claw (est. $2,500-$5,000). 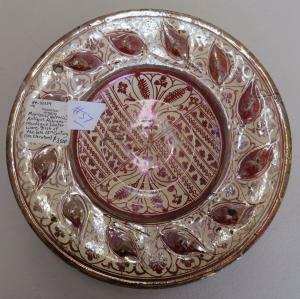 15th century Manises Valencia (Spain) ceramic dish, repaired (est. $3,500-$7,000). The catalog also includes 20th century Native American and Mexican jewelry. Many pre-Columbian artifacts are from a high-end Rancho Santa Fe, Calif., estate. EL CAJON, CA, UNITED STATES, October 30, 2018 /EINPresswire.com/ -- EL CAJON, Calif. – Helm Auction, Inc.’s end-of-year Holidaze! 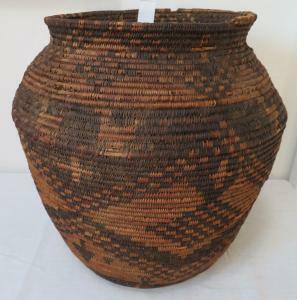 auction on Saturday, December 1st, will be jam-packed with over 550 lots of Native American artifacts (such as Navajo weavings and Pueblo pottery), pre-Columbian artifacts, other pre-historic items (like arrowheads and stone tools), oil paintings and other fine artwork, Oceanic, African and Asian tribal artifacts and more. The catalog also includes Native American and Mexican jewelry from the 20th century. Many pre-Columbian artifacts are from a high-end Rancho Santa Fe, California estate, collected by a dentist and descended in the family. Items include fine Native American baskets, antique and decorative glass and ceramics, Japanese and Chinese antiques, plus Helm’s usual tribal offerings. The online-only auction will get underway promptly at 9:15 am Pacific time, with internet bidding provided by LiveAuctioneers.com, iCollector.com and via the Helm Auction website, at https://live.helmauction.com/auctions/1-1BFBRZ/helms-end-of-the-year-holidaze. Absentee bids can be submitted via email, to admin@helmauction.com, or by snail mail, to Helm Auction, Inc., 772 Jamacha Rd. #303, El Cajon, CA 92019. Due to staff limitations, there is no phone bidding. Two rare and highly collectible lots are expected to battle for top earner of the sale. One is an original oil on canvas figural landscape painting by the Latvian-born German painter Johann Valters, better known as Walter Kurau (1869-1932). The painting, housed in a handsome gold gilt frame measuring an impressive 62 ½ inches by 61 ½ inches, should reach $40,000-$55,000. Another is lot 201 – an 8th century Bactrian camel figure from the Tang Dynasty, made of terra cotta and paint and a fine example of a centuries-old ceramic (est. $50,000-$150,000). 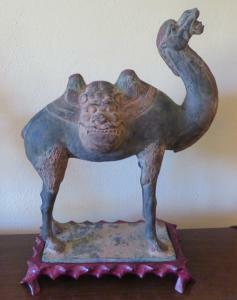 The camel stands 21 inches tall and is very finely modeled, with its head raised in a powerful, stately pose. The figure stands foursquare on a mahogany wood-fitted plinth measuring 8 inches by 6 inches. Another lot to watch is the museum-quality Teotihuacan (Mexico) granite mask, 2,000 years old and measuring 8 ½ inches by 7 ½ inches by 3 ¾ inches. The mask, having core drilled eyes and mouth, has only some minor wear to the ear, nose and lower lip and should bring $3,000-$9,000. The pre-Columbian artifacts from the Rancho Santa Fe estate will feature a Chupicuaro (Mexico) polychrome female doll made of clay and paint and large at 11 inches tall, with just a minor chip on the toe (est. 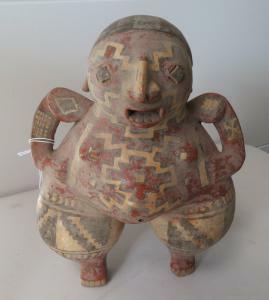 $3,000-$12,000); and a large male Colima (Mexico) figure, also made of clay and paint and even larger at 13 ½ inches tall, with an unusual face (est. $3,000-$10,000). Other pre-Columbian items will include a scarce stone turkey from Mexico City, Mexico, made of basalt, measuring 12 inches by 10 ½ inches by 9 inches, quite heavy (est. $2,000-$4,000); and a large stone head from Olmec, Veracruz, Mexico, pulled out of an old 1960s-era San Diego, California collection and showing a nick on the bridge of the figure’s nose (est. $3,000-$6,000). Native American objects are highly collectible and will be plentiful in the sale. A large White Mountain Apache (Arizona) basket, made in the 1920s of willow and devil’s claw and measuring 18 inches by 3 inches, should command $2,500-$10,000. The basket has a fine geometric design. Other Apache lots include a lovely old circa 1890s grain barrel, made by the White Mountain Apache in Arizona of willow and devil’s claw, having crosses, diamonds, deer and arrowhead designs (est. $2,500-$5,000); and a nice, polychrome San Carlos Apache (New Mexico) olla, circa 1940s, made of willow, red bud and devil’s claw, in good condition (est. $2,000-$6,000). A Northern Plains Blackfoot/Cayuse dag knife with a fringed, square-bottom sheath from the Indian Wars period, made of wood, carbon steel, brass tacks and hard leather, 15 ½ inches in length, has an estimate of $1,000-$3,000. The pitted blade is decorated with file burns and brass tacks; the sheath is constructed of harness leather, sinew sewn. The knife is in excellent shape. Rounding out the Native American category, a circa 1920s Pomo (San Francisco County, Calif.) beaded gift basket, made of grass and shell, very rare, is estimated to bring $1,000-$1,500; and a Northern Plains back rest, made of willow, string, sinew and cloth circa 1900, 55 inches long by 29 inches wide at the base, with nice paint and just a little cloth tearing, should hit $500-$1,500. A pre-historic frog effigy mortar from the Columbia River region (USA), made of granite and boasting beautiful patina, has an estimate of $1,000-$10,000; a cache of Clovis arrowheads, made of basalt and obsidian and discovered around Pocatello, Idaho, should hit $3,000-$6,000; and a 15th century Manises Valencia (Spain) ceramic dish, repaired, should bring $3,500-$7,000. Asian objects will feature a pair of Ming Dynasty porcelain plates, each plate 10 inches by 2 inches, with minor wear, has an estimate of $1,800-$3,600; while a stunning, hand-painted Japanese Edo Period painted porcelain bowl, 8 ½ inches by 4 ½ inches, should hit $750-$1,500. A buyer’s premium of 22 percent will be applied to all winning bids. No returns. Previews are by appointment; one can be made by e-mailing Helm Auction, at admin@helmauction.com, or by calling them at (619) 440-0320, at least two weeks prior to the date of the auction, December 1st. Helm Auction, Inc. is an online auction firm specializing in Native American and tribal artifacts. It is owned by Diane Harvey and Craig P. Helm, Sr. Diane is from the American Northwest and has always been attracted to Native American art and jewelry. Craig is Helm Auction’s resident artifact expert and auctioneer and has been collecting Native American artifacts all his adult life. For more information about Helm Auction, Inc., and the December 1st end-of-year Holidaze! online auction, please visit https://live.helmauction.com/.